Vietnam’s economy and Hanoi’s in particular were expected to face some challenges including high inflation, devaluation of the Vietnamese dong, high interest rates and changes in land policies. This will make a direct impact on the real estate market. Hanoi now has thousands of real estate projects in 29 districts and towns. For example, there have been a series of major apartment projects established from Le Van Luong street to ring road No 4 including Trung Hoa Nhan Chinh, Phung Khoan new urban area, Van Phuc, Van Khe, Duong Noi, An Hung, Park City, and Mo Lao. Many projects for low-income earners have also been implemented such as a housing project by Vinaconex Xuan Mai in Ngo Thi Nham street, Hai Ba Trung district, Hanoi or a 19 storey- building in Kien Hung ward, Ha Dong district, with a total of 1.512 flats. Especially, a project to build 10,000 flats for low income-earners in the Bac An Khanh urban area has also been urgently carried out. In the fourth quarter of 2010, the market for apartments became very hectic. Investors provided 2,850 new flats, up about 50 percent compared to the third quarter. Half of the projects have been put up for sale through capital contribution contracts. The demand for middle projects remains high. These projects have many advantages with reasonable prices of below VND1.5 billion and proper area or usage, said executive director of CBRE, Rechard Leech. In the fourth quarter of 2010 alone, the price of land in Hanoi increased by 12-15 percent on average. Projects in the west of the city saw the highest increase in price. For example, for projects in Ha Dong district, land price increased 18 percent compared to the previous quarter. Long Bien district also witnessed a remarkable increase in price with an average rate of 25 percent, although the district has few new urban area projects. “The sharp increase in the price of villas in 2010 was attributed to the fact that Vietnamese people have great demand for houses and like to invest in the real estate field, said Mr R.Leech. In addition, other fluctuations such as the exchange rate, gold prices and interest rates have made the real estate an attractive and effective channel. Regarding the real estate market in 2011, President of the Management Board from the Tu Liem Urban Development Joint Stock Company, Nguyen Van Kha, said in the second half of the year, this market will likely see positive signs. In the first half of this year, there should be remaining difficulties in the inflow of investment capital. According to CBRE’s forecast, 2011 will be a good year for customers with new choices as a major supply of real estate sources will be launched in the market. Investors will have to face many challenges this year due to tough competition in the market as well as new opportunities thanks to economic recovery in Vietnam and the world. Looking back in the office for lease market in Hanoi in the fourth quarter of 2010, two new projects will be put into operation including Sentinel Palace, class A in the centre and Lilama 10 Tower, class B in Le Van Luong street in the west of the city. 32,600 square metres of class A and B offices have been rent (the largest figure so far), mostly from the two projects BIDV Tower and Cham Vit Tower. The total area for rent has increased continuously in the quarter, showing a recovery in the office for lease market. In the short-term, valid projects will continue to face pressure due to fierce competition from major buildings to launch such as Crown Complex and Keangnam Landmark Tower. In addition, according to Rechard Leech, major banks are expanding their operations in the west, opening up new prospects for the real estate market in 2011. In the fourth quarter of 2010, no new trade centre was put into operation while the total supply for retail area remained stable with 118,500 square metres. However, the market saw remarkable changes as space for rent in the Hang Da Galleria trade centre project have been rent in the long-term. 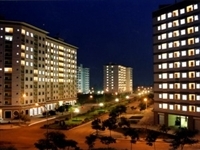 The project is expected to be inaugurated in April 2011. The Pico Mall project in Son Tay street is progressing well and will be completed in April this year. There no space for rent in the capital’s centre with stable prices, except for some in the outskirts as some customers left the Grand Plaza project. In 2011, the market will welcome the additional supply from projects including the Pico Mall (30,000 square metres), Hang Da Galleria (9,310 metre), Savico Plaza (52,000 square metre), and Keangnam Hanoi Landmark Tower (97,000 square metre). Experts predict 2011 will be a prosperous year for the retail market. In 2011, new supplies of sources will make the market become hectic. In addition, consumers also have habits of going to trade centres, and supermarkets, which will also make the market busier during the year, said Mr. R. Leech. Street stores will continue to attract customers and become a rival to trade centres, he said. New trade centres outside the centre will give a face lift to the retail market in these potential regions. Accordingly, many trademarks and services are forecast to appear, offering more options for consumers. At the same time, investors will meet the customers’ demand and speed up their advertisement activities.